When I was about five or six years old, my parents took me on an extended tour of Western Europe, but sadly I remember very little of it. All I can recall is feeding pigeons in Venice, climbing up the Sagrada Familia church in Barcelona and being on a ship named Augustus (which is, at the time of this writing, about to be scrapped in India), where I played with an Italian kid who claimed everything belonged to him (“é mio,” he would scream). It surely is a pity that I remember so little of that trip or the flavors I experienced, because today I am fascinated by the food from Spain, which I first discovered – as an adult – when I visited Café Espanol in Hell’s Kitchen and tasted some of their tapas. I was hooked from the start, and since then I have learned how to cook several of their famous dishes. Spanish cuisine is influenced by many of the cultures that conquered its land throughout the centuries, specially the Ottomans, who introduced various ingredients to the region. 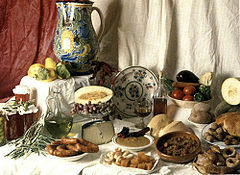 Spanish food is lively in flavor and color, thanks to their liberal use of saffron, chorizo (spicy sausage) and peppers. Though cooking the dishes can be a bit labor-intensive, the results are always a feast to the palate either if you choose to just have tome tapas or indulge in a full meal. Many Latin American cultures inherited some of their dishes, but many of these were modified in order to adapt to the different ingredients found in Latin America and the Caribbean. An example of this is ropa vieja (which translates as ‘old clothes’). While some versions in Spain include potatoes, chickpeas or even eggplant, the Cuban version is quite different. The same goes with arroz con pollo (rice and chicken). Comparing the Puerto Rican or Colombian versions, you can find considerable differences when looking at the Mediterranean version. But all are surely enjoyable in their own way. Add the onion and garlic to the pan and fry gently until beginning to soften. Add the chorizo and ham and stir-fry. Add the chopped peppers. Cook until they begin to soften. Sprinkle the rice and cook, stirring, for 1-2 minutes. Add the tomatoes, sherry, chicken stock and dried herbs and season well. Arrange the chicken pieces deep in the mixture and tuck in bay leaf. Cover and cook over very low heat for 30-40 minutes, until the chicken and rice are done. Mixture should be moist. Remove from heat and let stand for about 10 minutes and serve with garnishes. Do you remember Luiz and Ana, our friends from Valencia that we met in Paraná() They used to cook an easy dish (tortilas) a sort of omelet with potatos and onions. Its an easy dish and also delicious . Also rice with peas, and chorizo , onions and of course saffron, a dish cooked in the oven.I used to make tortilas and I often do. Your chicken and rice sound delicious. Earlier in the week I made a Spanish romesco sauce that would go will with your recipe. I can’t wait to try your dish.